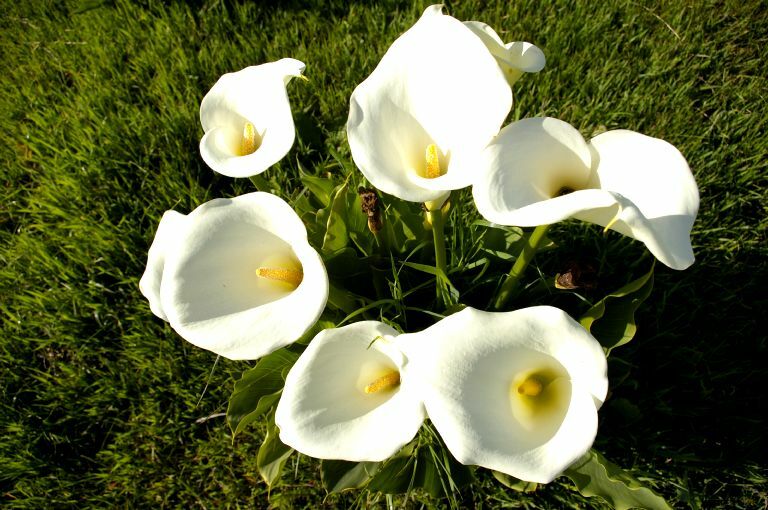 Spring time on the West Coast brings an array of wonderful wildflowers. It also means it’s time for the annual Darling Wildflower Show from 14 – 16 September 2018 at the Darling Golf Club. The indoor exhibition of indigenous flowers is fascinating and will spark an interest to get into the nature reserves to discover these many specimens in their natural environment. The show also has activities for the whole family and is not to be missed. Hi, I’m Paul Martin from Aloe Cottage in Darling. Darling IS BEST KNOWN FOR its won­der­fully diverse spring flowers, the Voorkamerfest Theatre and Arts Festival, Evita se Perron (the home of Tannie Evita Bezuidenhout), great wine farms, art gal­ler­ies, country-style res­taur­ants and bis­tros, the Duckitt orchid nurs­ery, the friendly small-town atmo­sphere and relaxed coun­try life. GET YOUR PICTURE TAKEN AT Evita se Perron where you can pose as “the most fam­ous white woman in South Africa” and take a humor­ous trip down South Africa’s memory lane at Boerassic Park. OTHER HAPPY SNAPS CAN BE TAKEN while sip­ping wine at some of the local wine farms like Ormonde, Cloof, Darling Cellars, Groote Post and Tukulu. WHEN THE WEATHER’S GOOD, I LIKE TO cycle around the vil­lage and farm­lands with my cam­era. The Nguni cattle at Oude Post Farm are par­tic­u­larly beau­ti­ful with their speckled hides and long horns. WHEN THE WEATHER’S BAD, I LIKE TO browse the amaz­ing selec­tion of books at Book League. BEST LATE NIGHT SNACK FROM Café Mosaic, known by the loc­als as ‘The Stoep’. MY FAVOURITE bar­gain hunt­ing SPOT IS The Mantis Trading Store. IF YOU WANT TO MEET LOCALS, GO TO the Darling Country Market on the first Saturday morn­ing of the month at the Nitrophoska Building. Darling’s BEST KEPT SECRET IS the local butchery, Darling Vleismark, per­fect for stock­ing up before return­ing to the city. And don’t miss the cheap homemade jams at the till! 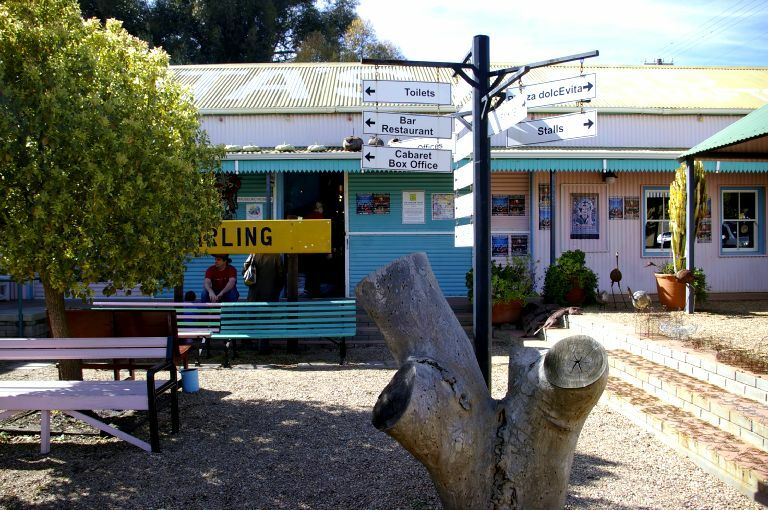 MY FAVOURITE THING TO DO WITH FRIENDS IS enjoy the local beer, Darling Brew, avail­able at most res­taur­ants in Darling. 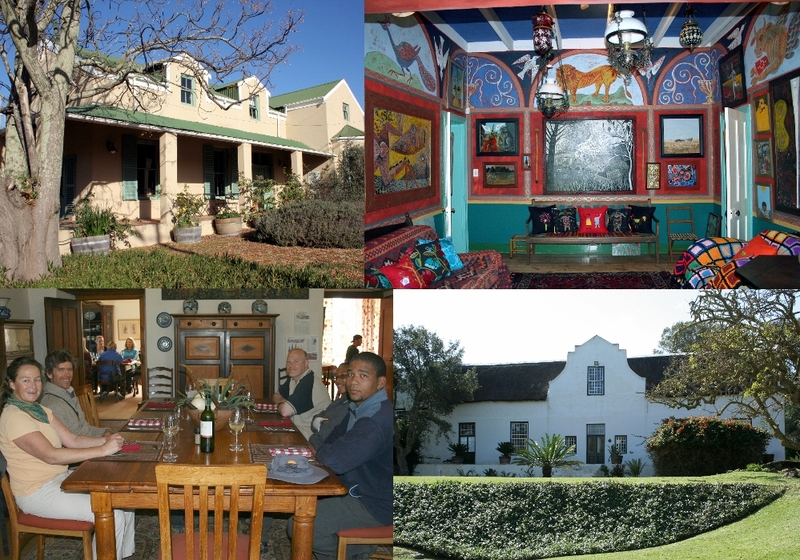 FOR SOME CULTURE , I LIKE TO GO TO the Voorkamerfest in September, where per­formers from South Africa and around the world give intim­ate per­form­ances in the ‘voork­amers’ (lounges) of houses in Darling. It is not to be missed. TO RELAX AND RESTORE MY SOUL, I LIKE TO enjoy the beau­ti­ful sur­round­ings. IF YOU’RE FEELING ADVENTUROUS, TRY mak­ing your own wine at the annual Darling Cellars Crush Day. 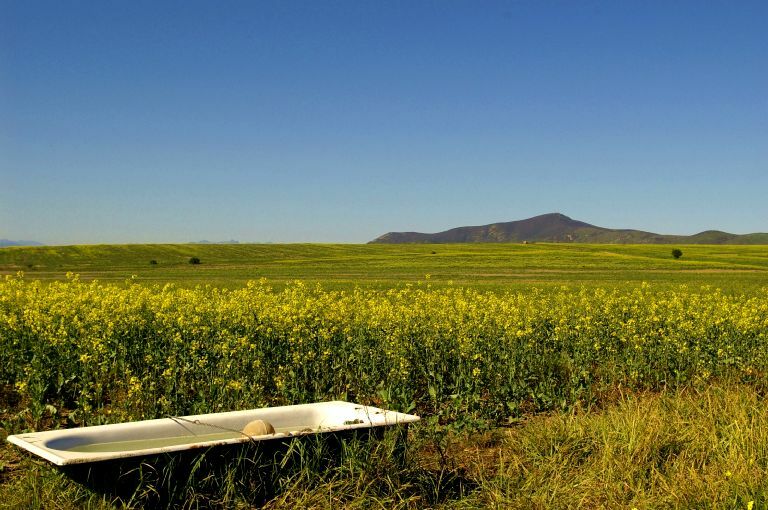 MY FAVOURITE WALK IS with my dogs at the Renosterveld Reserve at the top of the hill, where you have pan­or­amic views of the vil­lage and sur­round­ing farm­lands. MY FAVOURITE gift and home­ware SHOP IS is the beau­ti­ful ware­house at the back of The Marmalade Cat. MY FAVOURITE bird WATCHING SPOT IS from the kit­chen win­dow at Aloe Cottage, where the weaver birds put on a fant­astic dis­play build­ing their nests and show­ing off their dexterity. MY FAVOURITE BUILDING IS Koekemakranka Backpackers, FOR ITS cre­at­ive and whacky interior, cre­ated by local artist and co-owner Omnia Grobler. TRAVELLING WITH CHILDREN? A FUN OUTING IS Lelieblom Farm Restaurant where the kids can see and touch farm anim­als. Enjoy a lazy week­end lunch where you dine with your hosts and enjoy true coun­try hospitality. BEST CHEAP AND CHEERFUL OUTING IS tak­ing a leis­urely drive around the coun­tryside. WHEN MONEY’S NO OBJECT, I LIKE TO go wine tast­ing, stock up my cel­lar with excel­lent local wines, then enjoy a cel­eb­rat­ory meal at Hilda’s Kitchen at Groote Post. THE MOST UNUSUAL THING I SEE HERE IS the dif­fer­ence that one per­son, Pieter-Dirk Uys, has made to a com­munity by put­ting Darling on the map and giv­ing so much to sup­port devel­op­ment pro­jects in the area. WHEN I WANT TO GIVE BACK TO THE COMMUNITY, I sup­port The Darling Trust. 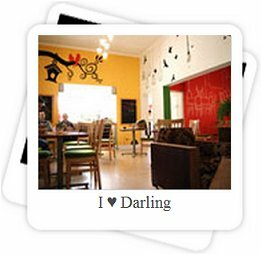 I ♥ Darling BECAUSE the people are friendly and wel­com­ing, the vil­lage is authen­tic and not overly touristy, and it’s an hour from Cape Town… but a world away! 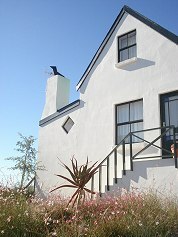 Aloe Cottage offers lux­ury self-catering hol­i­day accom­mod­a­tion in Darling, near to Cape Town, South Africa. We are pet-friendly! The hol­i­day home has been beau­ti­fully dec­or­ated with top qual­ity linen, fur­niture and art­work and enjoys pos­sibly the best views in Darling — over rolling hills and farm­lands to the dis­tant moun­tains. 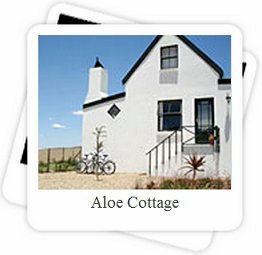 Aloe Cottage is the per­fect romantic get­away for couples as well as for week­ends away with friends or fam­ily holidays. 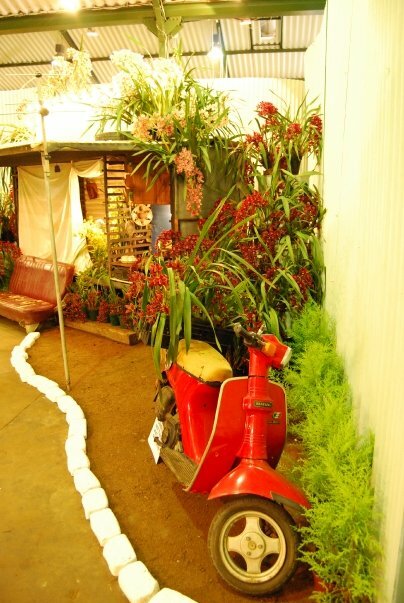 The Duckitt Nurseries Annual Orchid Show takes place from 15 – 18 September 2011 on Oudepost Farm 3km outside of Darling (follow the yellow banners). Landscaping done by Attie Hofmeyr with thousands of exotic orchids and rare species. Various orchid potplants, spikes and all the necessary accessories for sale in the sales area. Tearoom serving light meals hosted by the Presbyterian Church. See the spring flowers for free! 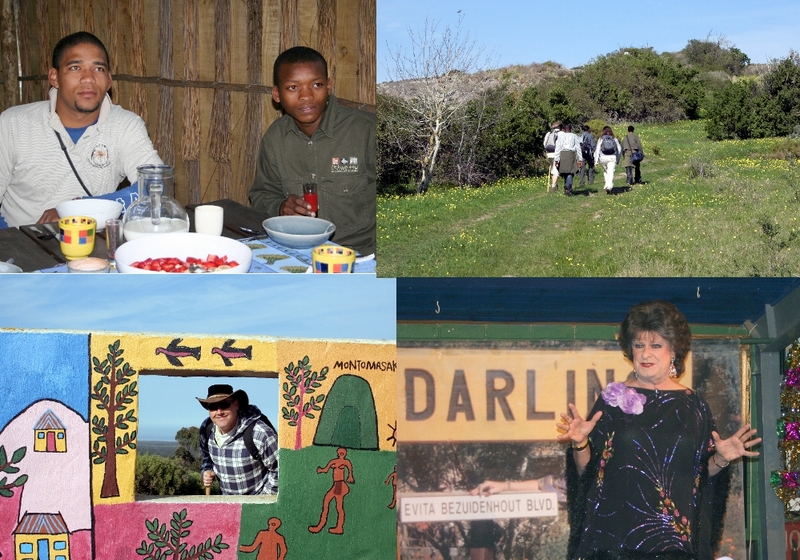 The Darling Stagger (launching September 2011) :- A slow-paced, mouth-watering hiking trail from the hills of Darling through wine and olive farms to !Khwa ttu San Cultural Centre and down to Yzerfontein on the coast. This 2.5 day, 25km trail begins in Darling. Tucked away between hills of vineyards and golden wheat fields, the trail winds through olive groves and wine farms up to the highest point in Darling where you will take your time sampling local fruits of the vine direct from the farmer. These new 2.5 day slackpacking trails, without the schlep, are guided and catered, comfortable and safe. Hikers carry a small daypack, lifts and luggage are organised and local folk and restaurants prepare meals in traditional West Coast style. For more information, full itineraries and prices and to book please call or email. Paul and I were invited to explore the brand new Darling Stagger, a cycling and walking slack packing trail between Yzerfontein and Darling. The Darling Stagger is one of the five trails planned within the CWCBR. The other four include the Eve’s Trail (a walk mostly along the West Coast National Park beach), the Five Bay Trail (a coast hugging walk between Paternoster and Jacobsbaai), Wheels of Time (a cycling tour from Mamre via West Coast National Park to !Khwa Ttu), and the Berg River Canooze (a kayak trail from Hopefield to Velddrift). With Cape Town rapidly expanding north, West Coast communities recognised that action was required to ensure that conflict between urban expansion and the diverse ecosystems on the West Coast would not get out of hand and appropriate development plans were put into place. Hence the CWCBR was proclaimed in 2000. The idea behind the UNESCO Man and Biosphere Programme is a sustainable and balanced approach between human development and nature conservation. 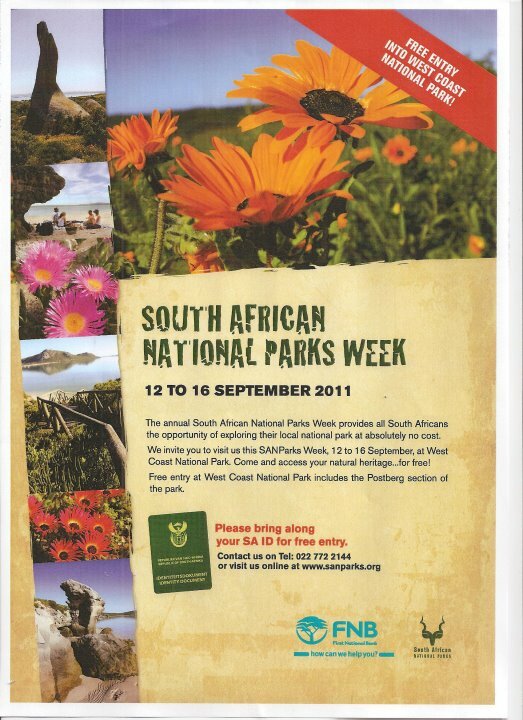 Part of the sustainable development of the CWCBR is enhancing its tourism potential and the Cape West Coast Trails are part of this philosophy. At lunch time we left Cape Town on an unseasonally warm & sunny day. The meeting point just outside Darling at Alexanderfontein Farm was also the first activity of the weekend. Olive tasting at the home of Darling Olives is an all-round olive education on growing, pressing, and use of these originally Mediterranean fruits. As a non-olive eater, I was fascinated and partly converted. A total surprise to see how many uses olives can have. From your simple virgin olive oil and cured olives to olive pastes and olive cooking & bath salts. Maybe I am pretty ignorant when it comes to these little fruits, but the biggest revelation was to learn that black olives are just ripe green ones. Always believed these were different types…. After this olive experience we set off to !Khwa ttu, San Education and Culture Centre and home for the night. We worked up a bit of an appetite with a cycle from the Bush Village Camp to the Atlantic Ocean for a traditional African sundowner. Staying in locavore style, we had a Darling Brew, a slow beer inspired by the rare geometric tortoise. Although a reasonably light beer, the return cycle was far more challenging than the first leg. Or maybe it was more due to the fact that we ended up cycling in the pitch dark, under the most magnificent night sky? The Scorpio constellation was a gentle reminder that it really still is winter in South Africa. 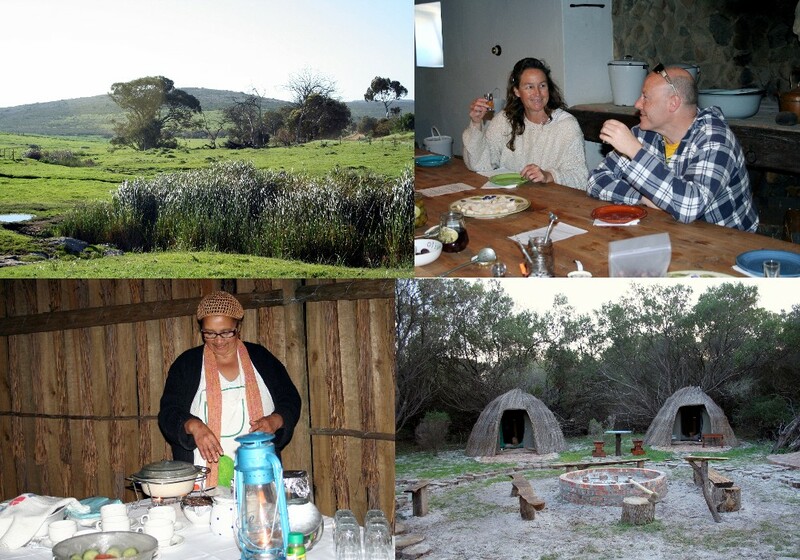 Returning to camp, a typical West Coast dinner was awaiting us, mussel soup, grilled snoek, and several traditional deserts prepared by Natasha and Cariline from Langebaan. All flushed down with the lightly wooded Quercus Gold Chardonnay from the Darling Cellars. Was this setting the standard for the rest of this slack packing weekend? Can it get even better? Waking up after a chilly but comfortable night, I bumped into yet more great cooks. Natasha & Kyle from Chefs on the Move in Scarborough, although not quite Darling local, were here to show our guides, Morgan and Jacky, what can be achieved with some TLC and fresh ingredients. For a change I was not the odd one out, the lonesome vegetarian, the one declining a full cooked breakfast. This time breakfast consisted of Mobi’s organic granola with fruit & yoghurt, a vegetarian spicy Lebanese take on a cooked breakfast and good quality coffee. Basically I was in heaven. Coming down to earth with a bang, I realised why this weekend was called the Darling Stagger. After all this fabulous food, walking is no longer an option. So we just staggered to !Khwa ttu, where Ivan gave us an introduction to San medicinal knowledge of the Fynbos vegetation. Fynbos is not only the most diverse vegetation types known on earth, it is also rich in medicinal purposes. From !Khwa ttu we walked through the fields, vineyards, and olive groves of Ormonde and Alexanderfontein with stunning views of Table Mountain, Dassen Island, and the Atlantic Ocean behind us. The terrain varies from sandy & grid tracks to some tarmac roads or just through the fields. The trail is not hard, you only carry your day pack and the distance is limited to about 15 km. I had no problems at all, so basically anybody in reasonable shape can do it. After about three quarters of the hike, we arrived at an idyllic setting in the olive groves, where a Bedouin type tent was erected, straw bales set out to give the old legs a good rest and a delicious light lunch of salads ready to be devoured. Natasha, Kyle and Morgan had done an sterling job! The last stage of the stagger was fortunately mostly downhill, a good thing as drinking wine at lunchtime and climbing hills is not a good combination. Little did we know however that more wine was on the itinerary with a full blown Ormonde wine tasting. For some strange reason, nobody seems to quite remember how many wines we tried, but I can tell you we sampled the whole Alexanderfontein, Ondine, and Ormonde ranges. The evening programme was the cherry on the cake – Evita Bezuidenhout’s Christmas in July show and babotie at Evita se Perron in Darling. Having heard so much about Evita se Perron and Pieter-Dirk Uys’ character Evita Bezuidenhout, I can confirm that all the praise is well-deserved and more. She is not only funny, but very sharp and willing to stick her neck out by tackling political issues in a way that everybody, regardless age, gender and race, will listen to and take note off. In addition, she does amazing work raising funds for the Darling Trust. Girl you totally rock! The second night we stayed in the heart of the sleepy village of Darling in Trinity Lodge. Here you don’t need an alarm on Sunday, as the church bells, calling Darling’s community to the early morning service, wake you well on time for breakfast. After breakfast it was time to burn some of those calories with a short cycle through the village, a visit to the fascinating Darling museum and Nicolaas Maritz’s Studio Gallery. Nicolaas, a well-established local artist, decided it was time to have a proper Studio Gallery, so people can have a look ‘behind the work’ and understand it better. He created the most incredible house full to the rafters with art, mostly his own but also some of his fellow South African artists. You roam from one room into the next, into his waterwise garden and his studio, and lose yourself in his intriguing work described by art critics as zippy, post-modern ethno-centric punk, naive, and challenging. No idea what that means, but I love his work. The finale to the Darling Stagger is wine tasting and lunch at the historic Groote Post wine farm. I have always liked their wines, but the Groote Post Chenin Blanc 2011 is exceptionally good and great value for money. The mini ‘Ice Age’ last spring led to a very late harvest of this cultivar and the beautiful guava and green-apple flavours. Overall the Darling Stagger slack packing trail was a great success with fabulous food, wine tasting to make anybody’s mouth water, mixed with a good amount of calorie burning of walking and cycling, and great company. Thank you guys for hosting us! notes: Special offer! Ask about reduced prices on initial exploratory trails. Click to download the full Flower Report – 29 Aug 2011 as a PDF file. www.darlingtourism.co.za or www.darlingwildflowers.co.za for more info. Most of the above will be evident in the other reserves and fields and more will be visible in the upcoming days. Tienie Versveld Reserve – as impressive as Groenkloof because it was also burnt. Super displays of Cotula and Blue flax especially at the top dam. Renosterveld Reserve – worth visiting but it is rather impenetrable in places with many bushes. Many varieties can be seen along the paths but if visitors are prepared to go off the pathways they will see a greater variety in bloom. Waylands now open. The reserve is dominated by the prolific early blue flax and the yellow coloured flowers. The contrast is very pretty. Here is a list of some of the species found: Late and early flax; Pyjama Bush; Various Bobbejaantjies; Lachenalia;Sterretjie –Poublom,Orange star and the small yellow star; Snotrosie; Chinese Lantern; Purple vygiebush; Bok Baai vygies; Yellow Gousblom; Agt dae Genees bos; Gheizhorrheiza: Small yellow and small blue ones; Felicia; Cineraria; Small yellow nemesia; Yellow ixia. A birdwatcher from Finland was most chuffed to have seen his first Clapper Lark. Please note that this is someone’s perception, and not a guarantee. 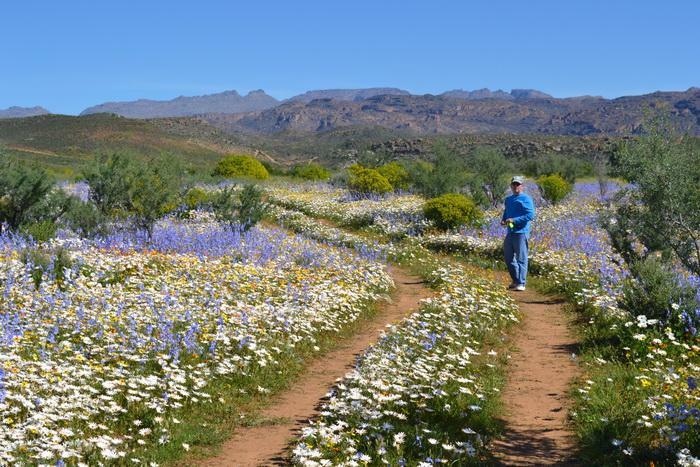 Wildflower game drives at Burgherspost Nature Reserve.